The castle-ii-standard-jumping-castle-13-x-13 will let your attendees have a royal bouncing time in this bright and happy bounce house. Little princes and princesses will rule in this brilliantly-colored castle with hues of orange, blue, red, green and yellow, perfect to suit any party theme, or to stand out during a busy event.. This easy-to-inflate castle-ii-standard-jumping-castle-13-x-13 is a great way to promote safe exercise and healthy activity for kids. castle-ii-standard-jumping-castle-13-x-13 is also available in a more spacious large size. Thrill for any prince or princess with this brightly colored castle. It’s blue, green, red, yellow and orange, along with four tall spires to make any palatial party a success. 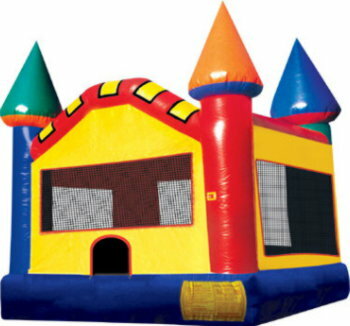 Promote healthy activity and entertainment with this go anywhere castle-ii-standard-jumping-castle-13-x-13, Moonwalk. Your party never looked so good. Jumpmaxx provides standard castles for the low price of $70. With over 30 Themes to choose from Jumpmaxx’s from Disney to a huge number of alternative themes it could be generic or pointed themes such as Scooby Doo, Superhero’s, Winnie the Pooh, ect. A Standard Castle is just a bouncing area without all the bells and whistles on the inside. Please keep in mind if you are going to a park you will need a Generator we provide these for the low price of $30. If you have your own you are welcome to use it, it must be at least a 3500 watt Generator with a 15 AMP breaker. JumpMaxx prides ourselves in providing America with newer, cleaner, high end entertainment with inflatables like the Mini Castle Slide and many others.